MICHELIN Pilot sport 3’s optimised profile enables it to cut through deep standing water, whereas other tyres may suffer from aquaplaning. Better roadholding in bends and three metres shorter braking distance on wet roads. More driving pleasure: very precise steering acclaimed by car manufacturers. 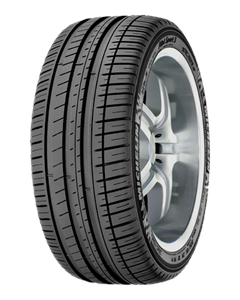 Energy efficiency combined with remarkable tyre mileage. "Anti Surf System": for optimum grip on wet surfaces. Michelin is introducing the "Green X" marking on a sport tyre range for the first time. High performance and energy efficiency with "Green Power Compound"
The "GREEN X" marking on the MICHELIN Pilot sport 3 sidewall indicates that it has one of the best energy efficiency levels on the market. Demonstrating that MICHELIN is committed to reducing motor vehicle fuel consumption, thus cutting CO2 emissions. This revolutionary rubber compound enables the combination of excellent wet grip with fuel savings and high mileage. This is down to experience gained from 13 consecutive Le Mans 24 Hour race victories. MICHELIN is thinking about the environment even with its sports tyres!